It's become a neighbourhood tradition. Every Dec.1st a lighted Xmas tree appears on the hillside above the line of houses. For years it was all alone. Then, one winter, a few houses to the west, a star glowed. A year later, just before Xmas, the figure of a snowman shone down from the hill a kilometer to the east. Last December it was joined by a cross. For a month these bright figures illuminate the darkest winter nights. The hill on which they stand is high and steep; slick with wild grass and sagebrush. Carrying, assembling and lighting these shapes demands time, determination and physical strength. In spite of that, the identity of the keepers of the lights is a mystery, except, perhaps, to their nearest neighbours. Many times I've walked below, peering up at the hill trying to determine just which dedicated families have gone to such trouble. It's impossible to tell. The editor of the local paper didn't know either, though he agreed the lights were lovely. Belatedly I realized that the guardians of the lights don't seek public recognition; they're happy giving beauty and pleasure to their community. At a season when the pressure to buy and 'give' can be overwhelming, let's remember others who gave, generously, spontaneously and anonymously, because there was a need and they cared. 2003 was a tumultuous year. Drought and fire ravaged B.C. Homes, forests and pastures burned. Just as overwhelming and unexpected as the fires was the depth of public response. 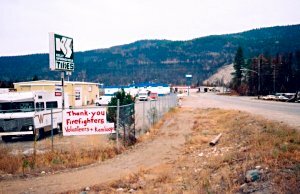 Highways were still closed, the fires were roaring north and east, when donations for those in need began to arrive in Kamloops. 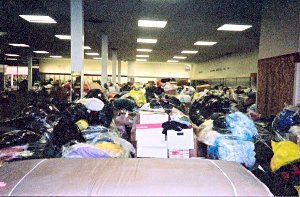 Soon they filled the Salvation Army distribution centre in the old Sears building. Diverse items from bottled water, to clothing, bedding, toys and work boots, came from all parts of the Province. A group of RCMP officers from Vancouver rented a truck to bring up their donations. A Kamloops woman purchased a new duvet set to be given away. People didn't just give goods; they gave their time. The secretary who took her holidays to help ended up co-ordinating volunteers at the centre. A mother and daughter who'd brought clothing for the fire refugees decided they wanted to stay and help sort donations. They joined others of all ages and walks of life. Teenagers worked beside seniors; the wife of a lawyer beside a young man who, since he had no job, took the bus downtown every day to drive the fork lifts moving pallets of goods. One evacuee from Barriere, her own home destroyed, came every day, in her wheel chair, to do what she could. "You're helping me," she explained to the Salvation Army workers, "so I want to help you." When he heard about the McLure fire, Sean, a youth from Nelson, B.C., didn't hesitate. He got on his mountain bike and began peddling north towards Kamloops. "Going to help the fire victims" read the sign on the back of his bike. Sympathetic motorists gave him rides. The last ride brought Sean to the very door of the Salvation Army centre. His benefactor drove away, only to return a few minutes later. "You stay with me and my wife as long as you're here helping out. ",he told Sean decisively. None of these volunteers expected publicity or praise. They just wanted to help in any way they could. The same can be said of the Mennonite Emergency Assistance crews who've traveled from all over Canada to build houses for people who lost their homes in the McLure fire. Quietly, efficiently, taking leave from their regular jobs, the Mennonites are hammering up walls and roofs, hoping that before Xmas, fire victims will be installed in new homes. When interviewed the Mennonite crews disavowed any claim to heroism. "The people who survived the fires are the real heroes" said one. He added how friendly the North Thompson people have been and said that the country, even after its scorching summer, was beautiful. 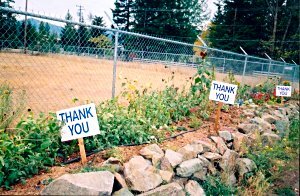 Such kindness from strangers is much appreciated in the fire zones where large "Thank You" signs appeared beside the highway, nailed to private fences and on placards along the road leading from the fire camp. And, what would a Xmas story be without hay and stables? In 2002 Alberta farmers suffering from drought received donations of hay from across Canada. This fall Alberta reciprocated. By Nov. 1st sixteen semi-trailer loads of hay, straw , and barley from Carstairs, Alberta had reached the Kamloops Exhibition grounds for distribution directly to North Thompson ranchers, farmers and livestock producers who'd lost forage and pasture to the summer fires. Farm families from Carstairs negotiated both the treacherous Rogers Pass and conflicting highway load regulations to bring aid. Distribution based on need was organized by the grateful ranchers themselves. Petro-Canada offered to cover fuel costs. Merry Xmas to the courageous victims of this summers' fires, now rebuilding their lives; to thousands of volunteers who unhesitatingly gave food, clothing and shelter to strangers; to my unknown neighbours who light up the dark December nights; and to all who are examples of the true spirit of the season.